Todolwen: Some Times Things Are Just Not Meant To Be ..
at times unfortunately things are not always not meant to be in life. 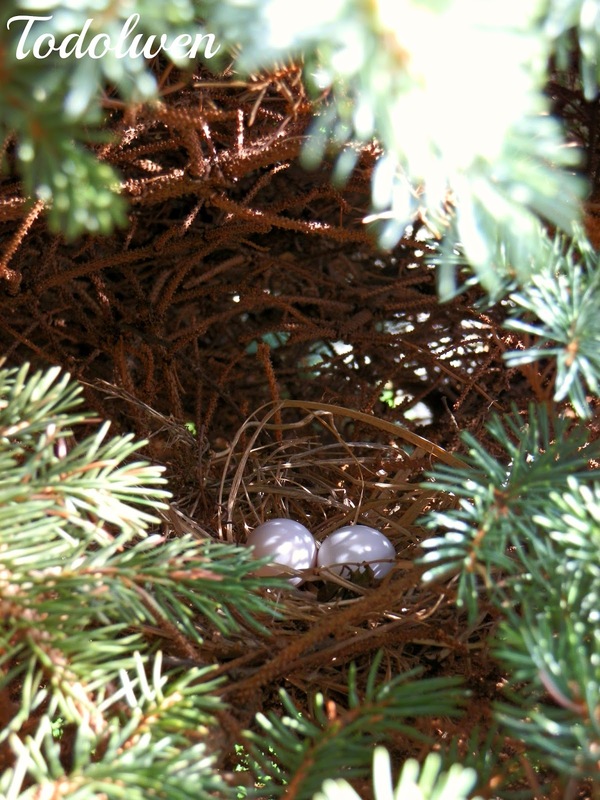 I am sad because our I hadn't seen our little mourning doves and they seem to have abandoned their nest about 6 days ago and with the nest ..
.. they left two little eggs behind. I am not sure why they left. I had tried to be very careful when taking photographs. All of them apart from one were taking from inside our house, from our living room window and from behind half closed blinds. I also made sure I never got close to the tree when passing. It might have been because they were just too close to our front door or maybe it's because neighbors have let their cats out again, which I have seen on our front porch and under the tree already. I did a little research and mourning doves are very sensitive to stress. If they sense any sign of danger or stress they are known to just leave their eggs or even their young. It is sad but I have to tell myself that that is nature and things happen for a reason. 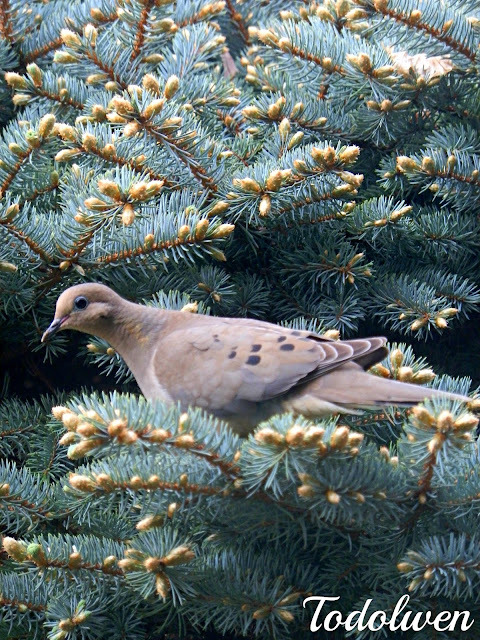 Then one morning, two days ago, my neighbor called to let me know that the doves had returned to the tree. ... which lasted only a few seconds but in the end the doves just left again and they haven't been back since then. 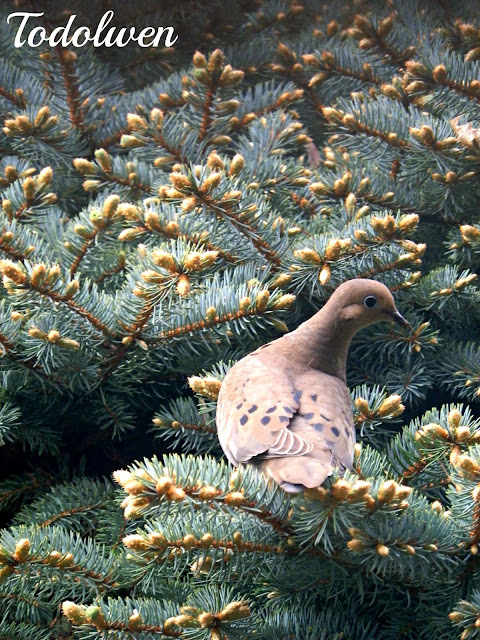 That means that unfortunately we won't have baby doves this year after all but maybe things will be better next year. I will just have to wait and see what will happen then. 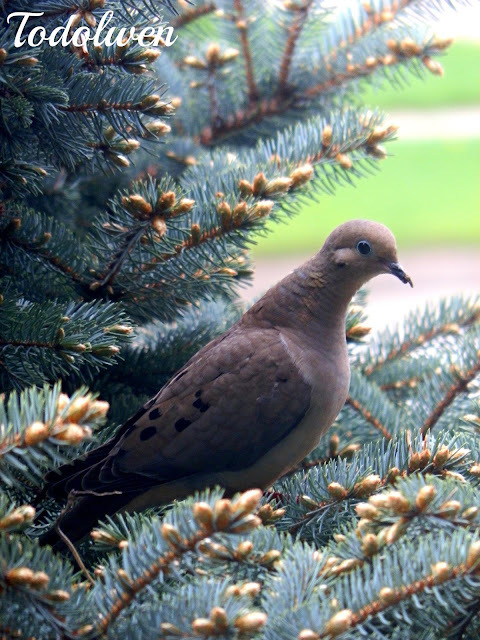 Maybe I will set up a nesting shelf for mourning doves somewhere away from where they would be disturbed. What ever happens I will share it with you. So sorry about your doves. I enjoy nest watching too, just had some wrens build a nest and hatch their young. Knowing how you love nests are you going to save this one with the eggs? My sister has done that with abandon nests and the eggs just dry up but they are very fragile - good for under a dome. Have a creative day. I'm sad for you, Karen ... I know you were looking forward to the babes. Like you said: "next year." Sorry Karen that the Morning Doves could not have a family this year. Hopefully next year. I think mourning doves have more than one family per year, so there's a chance that they might return. Hope so!